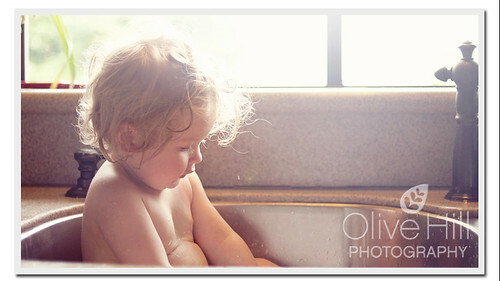 I had been waiting for the perfect night since my new D700 arrived to take some four year pictures of Ava. At last the rain stopped and off we went for a neighborhood walk. My big girl! The first image is one of my favorites. Love that tongue it has graced every one of Ava’s photo shoots it is such a part of her and her personality! Ella LOVED her cupcake at Ava’s birthday party. So much so she covered herself with it! 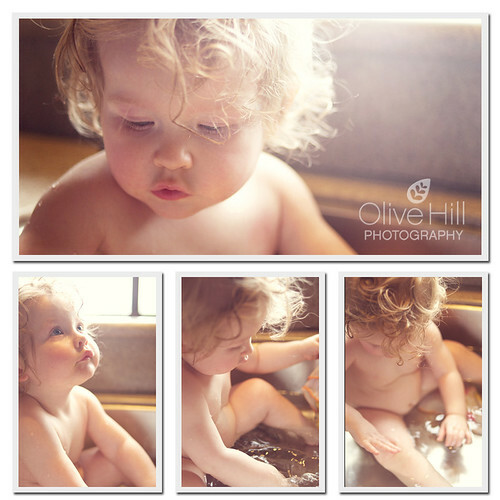 Quick sink bath = clean and happy baby. Of course it must have looked like fun because big sister had to join in! Ella, like her sister and mother, has a major sweet tooth. She will talk and point to the fridge and if you open it she immediatly reaches for the whipped cream can! If it is the cupboard she wants opened it is the marshmellow bag she seeks!!! Just means more Ella to kiss! Happy Fourth Birthday to my little “Alice”, you make my world Wonderland everyday! I have said it before and I will say it again, I LOVE to plan me a party. Not many themes are more fun than Alice in Wonderland. I have been obsessed and Ava and I had a blast planning and creating this celebration. From the storybook invitations to the eat me cookies I am so proud of this party. The table was adorned with goodies found from Craigslist, Goodwill and the Flea Market. I hand sewed bread and butterflies, made place cards for each character and made “drink me” tags for the tea pots. The guests entered Wonderland threw a tunnel and a cardboard rabbit hole. I had a bin of costumes, some hand made some purchased, to dress up in. My Little Alice however is sporting an adorable apron found on Etsy from, Peapodray. Could she be any cuter? I also purchased amazing Wonderland things on a stick from, Joosycardco on Etsy (SO FUN). They decorated a cardboard house, the white rabbits house, with markers and stickers. They collected roses scattered throughout the room to paint red, had a caucus race, and played some croquet with a flamingo and hedgehog of course. Tea sandwiches, fruit, decaf berry tea, eat me cookies, shortbread and chocolate tea bag cookies and cupcakes rounded out the menu for the little ones while the mama’s sampled quiche and mimosas! YUM! Ella LOVED her cupcake and I love that I captured her little tongue frosting tasting. The project I am most proud of has to be my wool felt mushroom stool with a tree stump base. It is so cute and sturdy. I cannot wait to put together a little reading playing nook for the girls to house it in. Take Me: I made each favor bag unique with an image and quote from the original story. The guests took home their tea cup and saucer, four playing card mint truffles and an Alice sticker book. For the girls I made Alice character inspired hair clips and for our “Mad Hatter”, who sadly was sick and unable to attend (Missed you Noah), a hedgehog finger puppet. Overall, a whirlwind but a whirlwind of success. It may be 10 months away but time to start planning for next year Ella will be two. A balloon party it is!